Join the fun fair on Theme Park: Tickets of Fortune and take part in one of six mini-games! Join the fun at Casino Room! The day is finally here – we're going to have a thrilling ride on NetEnt's newly released Theme Park: Tickets of Fortune! The classic fairground theme will appeal to players who used to love all the bumper car and the duck shooting action in their childhood days. Actually, it's not only these two games that are featured in this mobile slot, but four more too. Add to that the base game feature of the Claw and this game comes to a grand total of seven special features! This could even rival NetEnt's Guns N Roses, so let's see how Theme Park: Tickets of Fortune fared when we put it through its paces in this mobile slot review. In a nutshell, this is a very exciting summer release – we couldn't think of a more season appropriate theme that would be as vibrant and unique. This funfair themed NetEnt slot isn't just visually appealing, but it's also stuffed with feature games, where you can win multipliers and bonus cash too. As is standard, the new game has been rolled out for play on all platforms including desktop, smartphone and tablet. Yet, perhaps more eye-catching is the fact that it's got 50 paylines and seven featuers – plenty to keep you interested and go on playing all summer long. And now, for a limited time only, Casino Room are running a promotion to boost the uptake of this new NetEnt mobile slot. You can get up to 200 extra spins to check Theme Park: Tickets of Fortune out, so don't snooze! Will This Be The Ride Of Your Life? On first glance, Theme Park: Tickets of Fortune looks dashing. The slot itself loads very fast on a mobile device and the funfair music in the background sets the mood of ‘sugar-induced hyperactivity.' Think ice-cream, cotton candy and a bottle of an excessively sugary drink all consumed one after the other. This state is given a further boost when you start looking around: rainbow coloured balloons floating about, lower paying symbols shaped like balloons and higher paying symbols shaped like those special pricey balloons that your parents would almost certainly would refuse to buy. Now, you can certainly have it all – watch out for bumper cars, swan boats, horses, rockets and planes to take your wins to that other level. If you wouldn't have seen the any of the screenshots of this game, it still wouldn't be hard to guess that lots of primary colours are featured, the visuals are very basic yet entertaining and the graphics are all snappy and attention grabbing. Just like in children's amusement parks. Except that this game isn't for children, far from it. If you're of legal age to enjoy new mobile slots, then Theme Park: Tickets of Fortune could be the ticket to change your own fortunes. It undoubtedly looks a lot like Balloonies, but the way that the wins are credited is slightly different. This is a five reel mobile slot with 50 paylines. Let us just reiterate that – 50 paylines! This means that the scope for combining winning symbols is much bigger than in a standard mobile slot. From just 25p, you can spin those reels hoping for a combination of the special symbols to sweep you off your feet and get your heart racing. Bets range all the way up to £250 and wins come pretty regularly, making this a low/medium variance slot. What's more is the maximum win is 75,300 coins and depending on how much you're wagering per spin, things could get real serious, real fast. And that's not to mention the various features, such as the Stacked Wilds that can boost your winnings further. Read all about the features in the section below. Game Features: Here Come The Games! We'd be fooling you to think that this is an overly complicated game with many layers and way too many features to it. Superficially, seven special bonus features might indeed sound as too many, but almost all of them stem from the Theme Park Bonus feature. 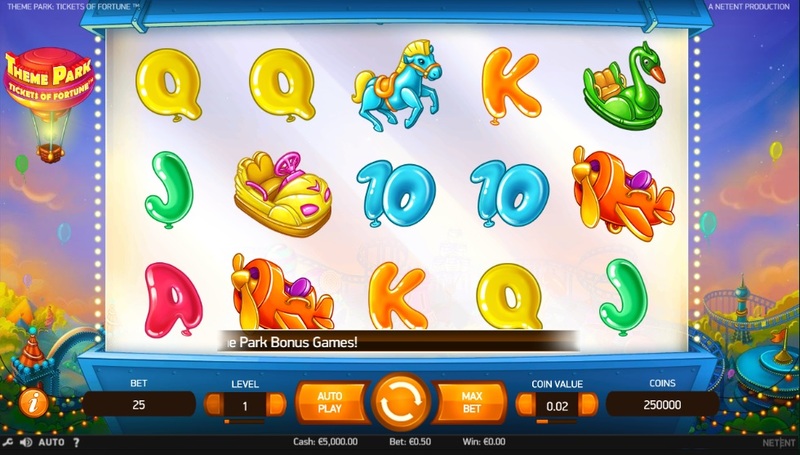 Thus, six funfair games are all available to play to score multipliers – it's great! But first let's chat about the two features which you might encounter while playing the base game itself. By this we mean excluding the bonus games that you can get to with three scatter symbols – more on which below. So, obviously there are the Wilds, which will substitute for all non-feature symbols and boost your winnings slightly. The stakes get higher and the wins get proportionally bigger when you take into consideration that the Wilds can come as Stacked Wilds. A full reel of roller-coaster cars can show up on reels two, three or four, or maybe even all of the above. If that's the case, a mega win is almost guaranteed as it will completely blow apart the paytable, in a good way of course! However, the Wilds cannot substitute for The Claw symbol, which is another feature triggering symbol. It will appear on the last reel only and will trigger a massive claw to come down and pull out a random prize from below the reels. 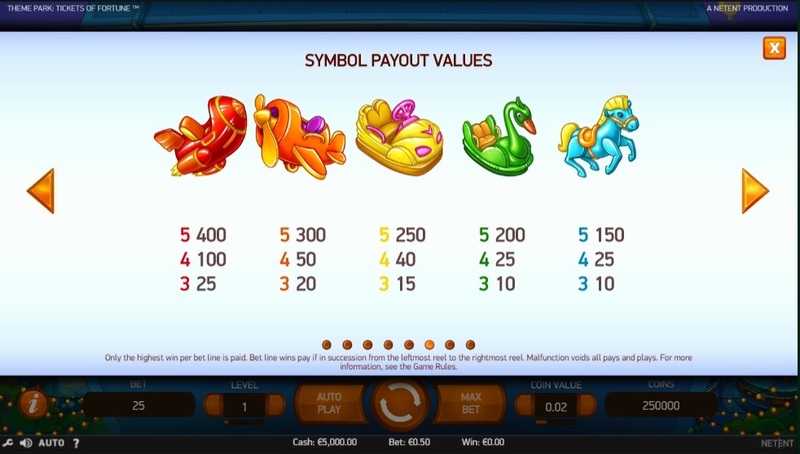 Graphically impressive, the feature also offers a good boost to your winnings. A multiplier anywhere from 2x to 15x will be applied to your latest wager amount. We know how frustrating those machines are and the chances of winning are rigged against the player. But don't despair as Theme Park: Tickets of Fortune has been vetted by the UK Gambling Commission and complies with all fairness regulations! In other words, the chances are higher of you winning every time you hit the Claw feature on this game than it is to get a fluffy toy out of those pure evil machines. Actually, let us re-phrase – there is nothing mini about those bonus games, because they really can either make or break your gaming session. But let's start at the beginning. When three scatter symbols show up on your reels, it's time to celebrate as you're taken through to the Theme Park Ticket Game. Think of it as a sort of preamble to the actual bonus game, where you will have a set number of goes at collecting tickets. 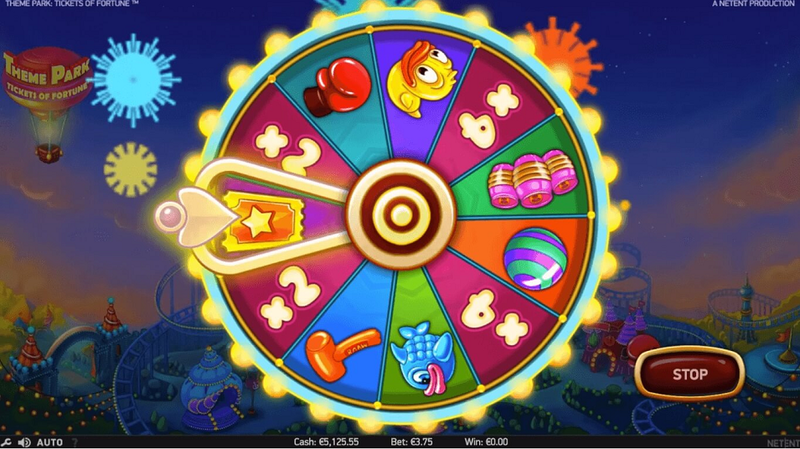 The main goal here is to collect as many tickets as you can to play funfair games later, but there's nothing you can do – just spin the wheel and hope for the best outcome. Then, depending on how many tickets you've gathered, you can choose which games to spend them on. Can Tower – three tickets to enter, knock down all the cans for a massive multiplier of 864x! Want to play Theme Park: Tickets of Fortune? It's available now, get in on all the fun! Claim bonus + extra spins now! Theme Park: Tickets of Fortune While every single mobile slot is a roller coaster with ups and downs, wins and losses, Theme Park: Tickets of Fortune epitomises everything that mobile gambling is about. It's fun and energetic, loud and out-there, plus it will take you back to your childhood summer days, when you could spend hours hogging bumper cars and trying to pick out toys at the Claw machine. Impressive graphics and soundtrack definitely come to aid that - NetEnt have made the slot look and feel as if you're truly back at that epic funfair in your town. Ups and downs are part of every game, so naturally it's not just winning on Theme Park: Tickets of Fortune. 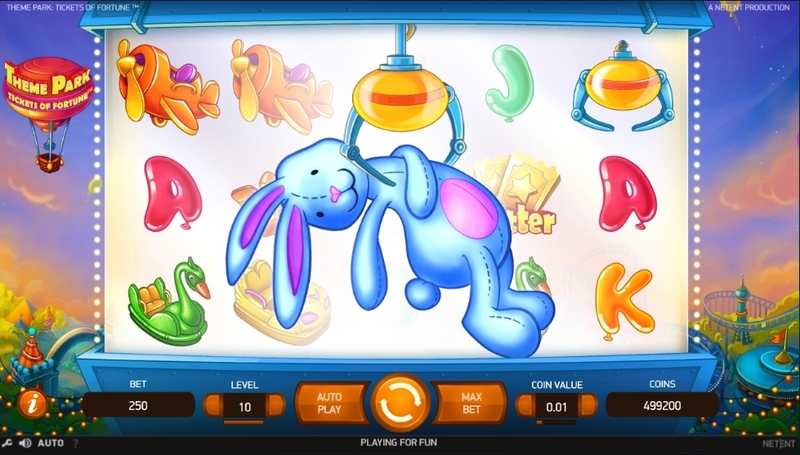 Whereas this machine could yield wins as large as 75,300 coins per spin and has 50 paylines to boost your chances, be prepared for long stretches of no bonus games. Plus, there are no true extra spins to speak of. Yet, if it sounds like just the game you've been waiting around for, why not give it a shot? And if you're looking for a place to play this as a mobile slot with no deposit bonus, check out the promotion that Casino Room are running and try out your luck. Review of Space Katz Mobile Slot – Landing At mFortune Today!